Maneuvering around a flight of steps down to the C train we entered the crowed lounge of No. 7. A loitering line five couples deep blocked our view of the dining room so I send my BF to find out what kind of wait we had in store… he returned with a 30 minute estimate and a cocktail menu. Scanning the list I fumbled over the effervescent Lambrusco and into the Mango, Cilantro, Chipotle Vodka, Sparkling Lime cocktail ($11). The chipotle lingers like undercooked taro (but in the good way) and the cilantro fills the nose with every sip, but the sweetness (or lack thereof) from the mango was inadequate to tie the libation together. I was only 15 minutes into my drink when the hostess came over to tell us our table was ready. Although we sat at what is probably the worst table in the house – next to the bread stations and bathroom hall – we were happy to be seating at all and we had a direct view into the spiffy bright white kitchen with the red bandana headed chef bobbing back and forth. 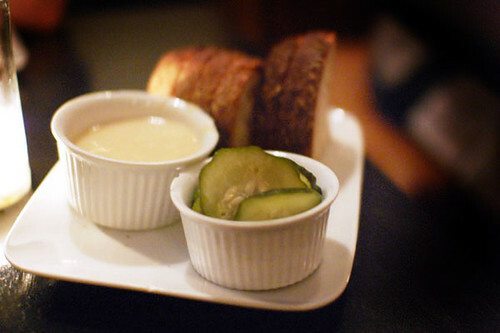 We were immediately presented with crusty bread and, be still my heart, a warm gooey white bean fondue and delicately thin and crunchy quick-pickles. When the waitress came over, with a friendly wave of my hand, I said “bring us every vegetarian dish” and then chugging my drink “and a Lambrusco!” Our table was promptly filled with 3 appetizers and a cool glass of wine –our waitress warned me it was a sweet bottle, which I loved despite the resemblance to Welch’s and day old club soda. 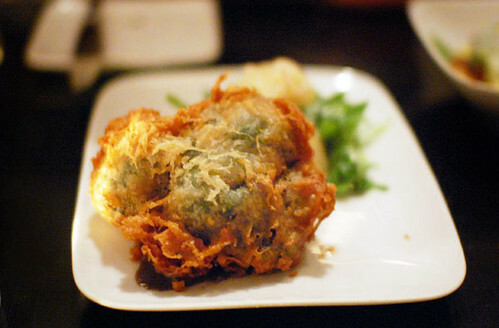 I was eager to get the “famous” Fried Broccoli ($7) in my mouth but I was sorely disappointed. From what I gather this is a middle of the country state fair kind of delicacy, and so if you grew up with this I’m sure No.7’s is fabulous; but this girl grew up refilling the ice bath for lacy tempura and so, to me, this dish tasted like a heavy over battered tempura. 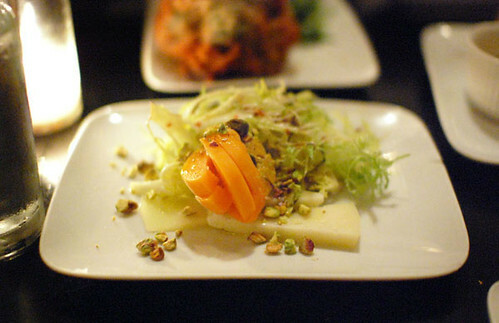 But but but… the Pimenton Smoked Mozzarella ($10) is what (my) dreams are made of. The bowl pools with thick smoky cheese under crispy fried artichoke hearts with an unidentifiable “lemon” crumbled thing on top. 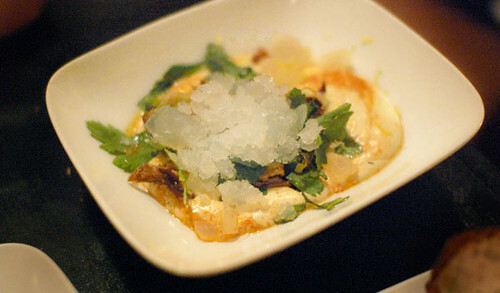 The icy white “lemon” is sweet and bitter with the consistency of… I don’t know… bizarrely cooked potatoes… and pairs perfectly with the cheese. 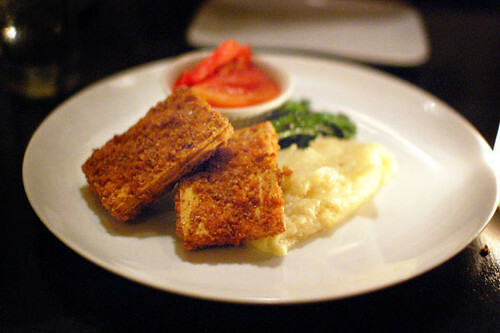 After a short break, we shared a plate of the Pecan Crusted Tofu ($17) which bares a notable likeness to filet-o-fish. I stared into the large ramekin of tomato wedges in slight horror, sad that such a significant proportion of this plate was a vegetable I don’t particularly care for. But as I ate the otherwise dry tofu I figured out the tomatoes act as a fabulously deconstructed sauce. The broccolini was marvelous, the inherent bitterness tempered by the rich sweet sauce, and light-years more scrumptious then the fried broccoli. The potatoes were vaguely gummy; I’d like to believe because of cheese and not over beating, but it was still otherwise pleasing. Although full, we were not leaving without tasting one of Amanda Clark’s desserts. 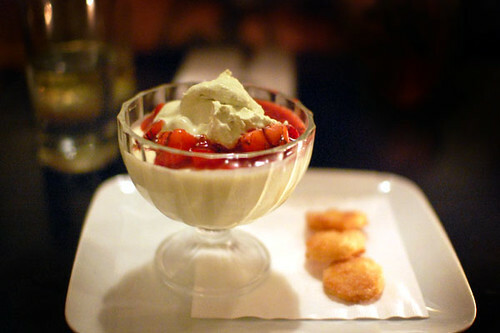 None particularly jumped at me, and so the waitress recommended the Buttermilk Pudding ($7) It was a perfectly light not in the stomach not too sweet finish to a filling dinner. Though I felt the pudding could have used a touch more cumin and I could have eaten an entire bowl of the “pie crust cookies” served on the side.